Like anyone else who ever writes about DNA, I could go on and on and on. But if you must — if you understand that it’s just for fun (and it is fun, I don’t deny that) — if you’re willing to accept that there’s a huge amount of the unknown in these estimates — then here’s the answer generally to the “what test should I take for ethnicity purposes” question. 1. For science. You’re not really serious about putting the percentages into your family tree, you just want to know a little more than you do now, and you’re willing to help the serious science folks learn more about ethnic origins. Then test with the National Geographic Society’s Genographic Project. This is a $179.95 kit (on sale) from National Geographic, it’ll look at YDNA markers (if you’re male), mitochondrial DNA (mtDNA) markers for both men and women and autosomal DNA for both men and women to gather information and give you results on very deep human origins. 2. For unknown parentage research. If you’re trying to identify an unknown parent or gather as much information as you can about your heritage without the benefit of parental data, you can still get some valuable information from the ethnicity estimates, as long as you keep in mind that they’re estimates, not take-to-the-bank numbers. And the company with the best overall estimates right now still seems to be 23andMe. The autosomal DNA test from 23andMe isn’t the cheapest, by any means: on sale it can be had for $149 (that’s what shows up on the wesbite right now) and full price has been as high as $199. But here’s the kicker. The default setting for the new 23andMe ethnicity reporting is called speculative, and only has a 50% confidence rating. Meaning that there’s a very good chance that what’s being shown is … um … cocktail party conversation. If you want to be more certain that the percentage information is real — that you really have that African or that Native American ancestry the report says you have, you need to change the setting to a more conservative reporting level. If that ethnicity du jour stays in the mix even at a conservative reporting level, then and only then can you be pretty sure that it’s really part of your ethnic origin. Beyond these two, I really can’t recommend any DNA test for ethnicity. Really. Even these, to some degree are — have I mentioned this before? — cocktail party conversation. We have to keep in mind what these admixture tests do: they take the DNA of living people — us, the test takers — and they compare it to the DNA of other living people — people whose parents and grandparents and, sometimes, even great grandparents all come from one geographic area. Then they try to extrapolate backwards into time. Nobody is out there running around, digging up 500- or 1,000-year-old bones, extracting DNA for us to compare our own DNA to. DNA testing is a wonderful tool. It can connect us with cousins we’d have never found otherwise to help us reconstruct our family histories. But in terms of “am I Native American?” “what tribe did I come from in Africa?” “am I 25% Irish?” No. No, no, no. That’s the absolute weakest aspect of DNA testing. They’re called estimates for a reason. But… if you must … pay the price and do it for science at National Geographic. Do it at 23andMe. And don’t complain when it doesn’t prove what it can’t prove. Ancestry DNA ethnicity estimate was spot on to my non identifying info. It was also accurately reflected my husbands ethnicity. That can happen… and then again there are many instances where it won’t. It’s as likely not to happen as to happen. You are absolutely right. No matter how many times something is said, it has to be said again and again. DNA companies are big money and they advertise to people who know very little beyond what they’ve seen on CSI. Ethnicity is something that the companies use to interest people. Most people know what percentages are with some exceptions. Can we say at least that the “cocktail talk” is not mentioned on the websites of these companies? Can we say that the problem of educating people like me is not going away because there are new people everyday. The growth of this industry has outgrown the ability of educating us. You have a natural talent for reaching people on different levels of education. Thanks. Thank you for your recent DNA posts. Somehow you seem to present and explain this complicated stuff better than others. I have always taken the ethnicity estimates with a grain of salt…but atDNA is a wonderful cousin finder. I think folks want something that will bypass all the many hours that genealogy often requires to trace and prove a lineage and one’s roots. However, there is no shortcut, yet. You are SO right that we’re all looking for that magic bullet … and that it doesn’t exist. Where is the Ancestry Composition Report found on Ancestry? The referenced report is not on AncestryDNA. The referenced report is on 23andMe. You have to test with 23andMe to have the Ancestry Composition Report referred to here. If you tested with AncestryDNA, what you get is called an Ethnicity Estimate, and it’s accessed from your AncestryDNA home page. The full details are opened up when you click on the See Full Ethnicity Estimate button. OK – more confusion on my part. I have tested with 23andMe, years ago. So I am still waiting on my transition. Where is this on 23andMe? I only see the three choices Speculative, Standard, and Conservative. This is the new version on 23andMe after transition. It’s the same thing as you see now on Speculative (for 50%) versus Conservative (for 80 or 90%). Well stated, Judy. Great post! No matter what the testing companies tell me I’ll always be 25% Italian, 25% Sicilian, 25% German and 25% Irish because that’s where my 16 great-grandparents were from. Is it fun to see a smidge of Middle East? Sure. But in rhe long run it’s ancient and meaningless. This is a bit off topic but since Maureen made the statement, “Somehow you seem to present and explain this complicated stuff better than others.” Had to seize the moment, thank you for all that you blog, lecture, video webinar…… just thank you, because I agree with Maureen, you have a gift for presenting information, you are a genealogist super hero! But can we trust cousin matches? Both of my adopted Vietnamese sons tested on 23 and me – – one about two years ago and the other very recently. That son R is trying to find his birth family, while the other son J who tested earlier wanted to see what his ethnicity is since he does not look typically Vietnamese. I manage both of their accounts, although I’ve mostly been looking at R’s data recently. Friday evening I decided to look at J’s data again too, checked out some others who had opted into open sharing, and found someone whose mutual relatives include R! I couldn’t believe it – – after 40 years of being brothers through adoption, we have discovered that they are also fifth cousins with 0.11% identical DNA (confirmed in R’s data as well). J has only 247 DNA relatives, so I’m even more amazed that his brother – – adopted a year before him and probably born in a different part of South Vietnam — is also his cousin! How reliable are these DNA matches? .11% shared DNA translates to about 7.5 cM. Is that all on one segment? Segments south of 8-10 cM are suspect. They could be distant cousins or they could just share a small segment by chance. Yes, one overlapping segment on “line” 4. Both have turned up as “Relatives in Common” to some other DNA Relatives. For example, NKT is listed as a DNA Relative of R. When I looked at the list of their Relatives in Common, J is among them. In several instances, R is one degree closer related to the other person (like NKT) than J is. I’ve had three uncles and an aunt tested at FTDNA. All siblings. Three of them show about 35% Scandinavian ancestry, while one is shown as being 75% Scandinavian. A different one has 5% Jewish. The other three do not. As you mention, it’s great cocktail party conversation, but shouldn’t be taken as being true. Each sibling inherits different portions of a parent’s dna. I for instance show 80% British whereas my sibling could show less British and more western Europe or northern Europe. Unless you are identical twins, siblings inherit different aspects of dna. My grand-uncle (paternal grandfather’s brother) got 0.1% Sub Saharan African ancestry. On this line of the family, there were many slave owners, who lived in Kentucky. Is there a possibility that this is more than just a fluke and something worth investigating. Also, this is a dumb question but I just want to clarify: if he has an African ancestor, would that ancestor be my ancestor too? Any ancestor of your grand-uncle is also an ancestor of yours (you both descend from his parents, grandparents, etc.). But whether a 0.1% ethnicity reading is real or noise — that’s a tougher question. If the ethnicity persists at a conservative reading (throwing the scale all the way over to conservative if this is on 23andMe), it’s more likely to be a real reading than a fluke, but it’s an awfully small reading and it could be very distant — back hundreds, even thousands of years in your ancestry. In your shoes I’d keep it in mind, if you come across something that needs an explanation. Thank you! I believe it does stay there on all confidence levels. Ancestry results – Like you, I got the “where did my Germans go and where are these Scandinavians coming from response.” I have documented around 38.5% GERMAN origin family history yet Ancestry says 5% (western europe) and 17% Scandinavian. Ok, some north Germans in Holstein probably have some Danish background…but that was only one gr grandparent. I have to assume I got the genetic cards for every Scandinavian gene – would love to have my brother test and compare what cards he was dealt. So, genealogically 38.5% German but genetically very mixed. I may have some drops from Normans in Sicily or in the small Scots Irish portion. In fact, they report Iberian (unknown to me) at 6% which must be mixed in my Italian side – and it exceeds my known German ancestry. I have seen info that northern Germany is more nordic in haplogroup representation. Maybe the results are accurate at the genetic level…who knows. Someone should write an article titled, “The Lost Germans – Why Does DNA Testing Hate Our Ancestors?”. I wish I had a dollar for ever time I’ve read about DNA testing not picking up on German ancestry… even people with four German grandparents. As the article states, take your results with a grain of salt. We’re all Scandinavians now. I did the full sequence mtDNA test with FTDNA. My earliest known maternal ancestor had a German surname and I suspected her family may have been part of the pre-Revolutionary Palatine emigration to the US. The results included no very close matches, but of the matches that were reported, half were to people long lines of maternal ancestors who all were born, loved and died in Norway going all the way back to the early 1600s. The rst of the list consisted of several Swedes, a few 19th century Irish and Scottish line, and 1 each from Germany and Spain. This was a surprise. It occurs to me that one explanation might be that Norwegians are climbing on the DNA bandwagon at a faster rate than people from other parts of Europe and so are over-represented in the pool from which the results are being drawn. Or it could simply be that a handful of women whose origins are out of Scandinavia produced an unusually large number of descendants who’ve now tested. Among other things, the speaker mentions that Sweden began keeping records in the early 1600s, and unlike many other European countries, their records remain almost entirely intact, so most Swedes can readily trace their complete genealogy back at least that far and, in some cases, even back into the 1500s (sigh of envy here). Even though his project does not deal with atDNA, I think everyone might find what he has to say very interesting. Now if only I had Swedish ancestors… 🙂 And, for the record, here is the link to all the Genetic Genealogy Ireland videos, and most are excellent. Interesting, my dad’s paternal side is German (near Trier & Bavaria) & maternal side is German from Gdansk. My mom’s side is Polish. From ancestry dna , I am only 4 percent western European but I am eastern Europe & Scandanavian. I reaaaaaaaally think AncestryDNA is having a hard time distinguishing German from Scandinavian. Trying to catch up with old posts. 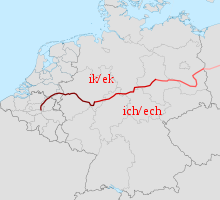 Would this not have something to do with the migration of Germanic tribes? I see the same in my family and especially in my son’s YDNA test and his father was German on the Y side as far back as they have researched – 1600s. I am pretty sure now the “Iberian” actually relates to Irish as my maternal aunt (Italian) has no Iberian. The closest genetically to the Irish are the Basques. Something to keep in mind…Iberian does not necessarily mean modern Spain / Portugal but more ancient populations…and can be related to Irish ancestry. While it is true that many people have unrealistic and/or ill-informed expectations for the ethnicity estimates calculated from autosomal DNA testing done by some of the major players, it is in the ‘early days’ of research and we shouldn’t think that current inaccuracies will always be the case. We should also keep in mind that there are three main tests (Y-DNA, Mitochondrial [mtDNA] and Autosomal [atDNA]) that can derive ethnicity and geographical origins and migrations in different time periods and ancestral lines. Projects like ‘People of the Bristish Isles’ (POBI… Google the YouTube Videos and project website) and similar projects in continental Europe, reveal that autosomal DNA may yet uncover surprisingly useful and specific information about geographic origins and migrations. By finding people with multiple near ancestors (ie Great-grandparents) that all lived within a small radius (ie 30km’s), and by comparing autosomal DNA tests, researchers have been able to tell a great deal about where they lived. There are some amazingly successful projects underway, to tie in Y-DNA and surnames with specific locations. One researcher has already launched a business researching in Ireland, Scotland and England. I regularly use the ethnicity tests (from atDNA) to ‘divide and conquer’ cousin matches between paternal and maternal lines, and now that I have a very well populated pedigree, what I am finding, is that the ethnicity estimates I have been given, seem to line up surprisingly well with what the paper trails (and other ‘artifacts’) show. I must take issue with the comment, “Nobody is out there running around, digging up 500- or 1,000-year-old bones, extracting DNA for us to compare our own DNA to”. Actually that is exactly what has been and is happening. In many cases where extractable DNA has been found in human archaeological remains, DNA tests have been done and there are whole projects to piece together origins and migrations based on ancient DNA markers, which you may compare to your own Y-DNA test, and know the region where your ancestor was at that time (ie. See GEDmatch Archaic Matches). The relatively recent identification of King Richard III (see the YouTube video) using mtDNA, gives us a hint of what may become possible, with less famous remains in the future. Nevertheless, it is not necessary to “dig up bodies” to find DNA. DNA from the past exists in us all, and we can partially reconstruct it, by having parents, siblings and other near relations tested. Using ‘phasing’ techniques, large portions of DNA can be reconstructed, and by comparing DNA results with paper trails, monuments (ie gravestones etc), and other ‘historical artifacts’ we can work out how people were related, where related people were and at what time they were there. I am slowly getting an albeit hazy picture (so far) of my Afrikana forebear’s migrations , as they slowly travelled from the Cape northward over the centuries, by comparing DNA cousin matches and information from traditional genealogical methods. I would appeal to readers, to realise that we are on the ‘bleeding edge’ of DNA research, ethnicity and human migrations. Don’t dismiss DNA testing, based on where it is today, because daily, weekly, monthly, astonishing breakthroughs are being made. Don’t put off testing willing elderly relatives, just because the technology is not there yet. The tests I’m getting done for my elderly parents (@US$69 each), I expect, will reveal amazing results and un-thought-of information over the next 25 years that samples are contracted to be retained (FamilyTreeDNA). With some testing companies, samples can be retested and upgraded, as technologies improve. Lastly I conclude, if you’re not taking DNA testing seriously in the future, you’re not taking genealogy seriously in the future. All excellent points, Jeff, and thanks for taking the time to share your thoughts. Thank you so much for a very informative and thought provovoking response. Now if you could only explain my trace result of Polynesian/Pacific Islands DNA. My brother got the same result so I am inclnec to believe the accuracy. It does make me wonder about my Norweigian/Sami/Swiss/German ancestors! I understand the limitations of the ethnicity report BUT I have found it is one of the top two reasons my first cousins have agreed to test for me. At first I did not spend much effort on sharing with them the “pretty pie charts. : But they were asking. So I made a simple chart to show how they compared one to another. They have had a ball comparing their ethnicity percentages with each other, including between siblings. I have made sure they understand the limitations. They don’t care. Cousins I thought would never test want to get in on the fun and have now tested. Meanwhile, I get more data for my research. Appears to be a win-win. That is the ONE reason why I’m glad the ethnicity reports exist, Debbie: if they convince others to test. Here is an article that shows why the German / Scandinavian results are often overlapped. I hold that the “Scandinavian” dna should be changed to something more generic such as “North Germanic” which encompasses the entire region. http://www.lowlands-l.net/talk/eng/scandinavian.html “In the early and mid 1100s the Hansa trade town of Lübeck was rising to prominence on the Baltic coast. Along with other Hansa towns, Lübeck allowed the Hanseatic League to dominate trade across Scandinavia and the Baltic for the next three centuries. Colonies of Low German speaking merchants, craftsmen and officials settled in many major Nordic towns, such as Oslo, Bergen, Visby, Stockholm, Malmö and Copenhagen. In addition, many aristocratic families from what is now Northern Germany settled in Denmark and elsewhere in Scandinavia, and these often held prominent positions and hence had the chance to influence the literary language of all three nations to quite a degree.” So, beside have common ancient ancestral tribal roots there has been quite a bit of mixing amongst the North Sea / Baltic peoples. One more illustration of the “Scandinavian / German” breakdown confusion via Ancestry dna results and why it exists https://www.familytreedna.com/groups/germany/about/results Note the light blue area – “northern Europe” which extends from Denmark through northern Germany and down the Rhine – North Rhein Westphalia region. The Hanseatic League and its encouragement of trade could also have had a strong impact on the genetics of the day too. But whatever the reason, the result is clear: Ancestry is not distinguishing many long-time German families from Scandinavian families — and may never be able to depending on the reference populations. I tested with different companies. I did my aDNA with Ancestry.com, took those results and plugged them into FamilyTreeDNA and received different results. Ancestry.com results were spot on with the paper trail, but the results from FamilyTree showed more Northern European and Eastern European influence. I’m still scratching my head over that one. Different reference populations and different analyses, that’s what does it. Each company has its own data and runs its analysis against its own reference populations. I am very new to DNA testing. I have been testing family members using ancestry.com in the last couple months. So far the Native American percentages are exactly the same between siblings while their Ireland, Great Britain and others are differing by up to 12%. Also child to parent Native American are exactly half (except when the child has Native American from both parents) Just my observation that Native American DNA must be very unique and specific. Hard to draw general conclusions from one sample, but yes generally NA tends to be rather specific. I recently had my DNA done with 23andme. I found in my relative matches a surname from a family I was trying to prove relationship to. After messaging exchanges I found that we were 4th cousins in that family sharing a great great great grandfather and grandmother. However, I also found that his great grandmother was the aunt of my great grandmother of a different surname. Do you think I can assume the matching DNA (.46) was of the family of the great great great grandparents, or could the great grandmothers influence the matching overlapping segment? With only the two of you matching, and two possible shared lines, you can’t assume anything about which line the shared DNA is from — you can’t even assume that it’s from one and not both lines. You need to test more cousins to be sure. Sometimes political realities “back home” change the reported data for people who no longer live there. One of my lines was known by family members to come from the eastern coast of southern Denmark. This has since been verified by baptismal records. In the U.S. census for 1880 birthplace of all family members is given as Denmark. In 1900 it’s Germany. In 1910 and after, birth countries are listed as Denmark again. One family member’s census said “Schleswick,” which was then lined-out and Germany written in. Yes, this area was Schleswig-Holstein and it was the border, rather than the residents, that moved several times. Both Ancestry and 23 and Me show little actual Scandi but high percentages of general northern European. Absolutely this is in part confused by the boundary changes: something that was Poland is now Germany and vice versa and so on and so forth. 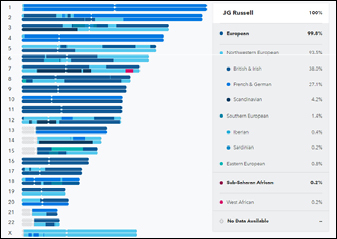 From 23andme, I received 1.3% Ashkenazi Jewish on the 50%, 60%, and 70% settings; 1.2% on the 80% setting; and 1.0% on the 90% setting. On both FTDNA and 23andme, I have many fully Ashkenazi matches on the ethnic Ashkenazi segments of mine. Would you say I have real Ashkenazi Jewish heritage? Whenever an ethnicity persists at the 90% level, I would consider it a real possibility. I agree. To add to this, if a percentage is still a full 1% at Conservative mode it’s more likely to be real as opposed to my case where it dramatically dropped from 3.4% on Standard to 0.2% in Conservative. Judy, I have 0.1> Yakut, 0.1 North African and 4.3% Ashkenazi on Speculative mode. On Conservative mode the Yakut dissapears, the North African appears and the Ashkenazi plummets to a meager 0.2%. I asked Doug McDonald if I was actually Jewish and he said it was just noise. I have ancestry from Poland that didn’t show up as Eastern European. Instead Ashkenazi shows up with barely any matches. My family knows I have no Jewish ancestry. Nobody has said anything about it and I doubt there’s a big conspiracy. Do you agree with Doug McDonald? Is there a way to know if I have any Ashkenazi for certain? Yep, I agree with Doug McDonald, and nope, no way to know if you have something for sure. It’s just not good enough at that level of granularity. Thanks for the input. I had a “few” Jewish matches that popped up at like 0.8% under country lister and is had Ukraine, Russia, etc who listed multiple countries as their ethnicity but not much. Maybe they were both Polish and Jewish and we share the Polish ancestor. I think they might have mistaken Ashkenazi for Eastern European/Polish since the borders over time have changed. It’s weird how Ashkenazi is centred on Poland and then they have Eastern Europe which doesn’t even include Poland. I have no Sub-Saharan ancestry on either mode yet I share a common ancestor with someone who has Sub-Saharan ancestry who lives in the US. I’m a Canadian. Potentially through slavery. I also had some weird matches from Iraq and Iran which I had no clue how they got there. (This was back in 2014 with the old system). Good article you have here, thanks for clearing it up. Are there any calculators to determine if it’s real or not? I don’t understand how a calculator can miss some 12% Eastern European ancestry. Are there any tools to try and find out if it’s actually false? I’m going to look on that side of the family tree to see if any conversion took place or whatever. Other than that, the percentages just don’t add up because I know I have Ethnic East European ancestry for a fact. Surely very few people on 23andme realize how meaningless a 50% confidence level is. In addition, there are presumably several outcomes at that level. So in only providing one outcome 23andme is being doubly misleading. 23andMe doesn’t just the 50% confidence level information. Every company has to choose a default, but you can change it all the way to a 90% confidence level by using the Change Confidence Level slider.